Here’s a quick look at where things stand in the AFC East after week one of the 2011 season. Tom Brady threw for a Patriots franchise and Monday Night Football record 517 yards last night as the Patriots defeated the Dolphins 38-24 in South Florida last night. The Patriots served notice to the rest of the league that their offense is going to force the issue on teams, as it seems there is an emphasis on a fast pace and what has been dubbed a pressure offense. The Patriots defense is a work in progress, but show some encouraging signs last night with the ability to get pressure on the quarterback in the second half, and with their newly revamped secondary making some plays. Albert Haynesworth made his presence felt in the middle, forcing a couple of costly holding penalties on the Dolphins offensive line. The Patriots play the San Diego Chargers this weekend in their home opener. The Jets won the Ryan Bowl on Sunday night as Rex Ryan’s crew defeated the Dallas Cowboys and their defense led by coordinator Rob Ryan. The Jets continue to pounce on any mistakes made by the opposition and make them pay dearly. The Cowboys made plenty of mistakes and allowed the Jets to capitalize and come away with a 27-24 win. TheJetsBlog though, says that this was an ugly win, with plenty of causes for concern. The Jets host the Jacksonville Jaguars this Sunday, and should move to 2-0. The Bills were one of the surprises of the weekend, going on the road and completely dominating a team that was in the playoffs last year. Buffalo destroyed the Kansas City Chiefs 41-7 on Sunday, giving head coach Chan Gailey a measure of revenge towards the Chiefs and head coach Todd Haley, who hired Gailey as offensive coordinator in 2009, only to fire him two week prior to the season opener that same year. Buffalo Rumblings offers some Historical Perspective on this win. 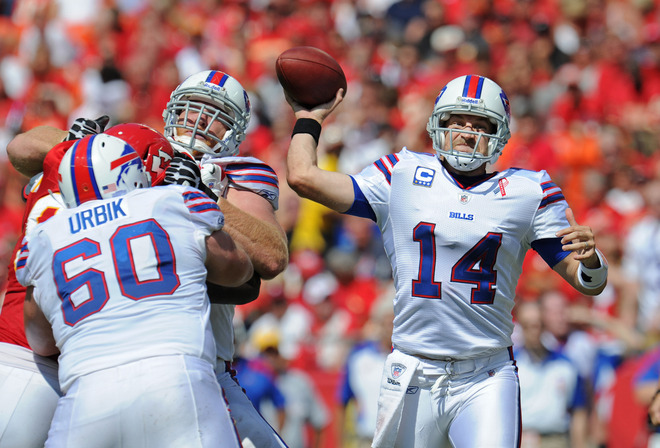 The Bills host the Oakland Raiders this Sunday, trying to move to 2-0 on the season. The Dolphins had a rough start to the season, but according to the Phinsider, still had plenty of positives to take away from this one, starting with the play of quarterback Chad Henne. Miami came into the season with plenty of questions about their head coach and quarterback, both of whom the team attempted to replace in the offseason. Henne played incredibly well, throwing for 416 yards and two touchdowns and rushing for 59 yards and a touchdown. The Miami defense was worn out by the Patriots offense, but I suspect they won’t the first this season to have that experience. That unit is solid and should have decent success this season. The Dolphins look to get in to the win column this Sunday when they host the Houston Texans, a favorite of many in the media to finally break into contender status this season.